There have been stories of people who became rich because they were so driven they still work long after most of us are already asleep. Staten Island man Salvatore Gandolfo had a different path to millions. You can say that insomnia helped him become a millionaire many times over. Unable to sleep on April 1 (yes April Fool’s day) he went out in the early morning hours and bought a $25 Silver Spectacular ticket at Richmond Deli & Grocery in Mariners Harbor. 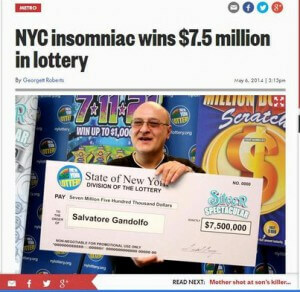 When he scanned the ticket it immediately said “Big Winner” and instantly he was $7.5 million richer.